For the people out there who still don’t know what a “hack” is, the current definition is “a quick and clever solution to a tricky problem”. When it comes to decorating it really just means an easy tip or DIY idea. So if you're looking for a clever and fun decorating idea consider trying one of these decorating hacks. Want to make your home look expensive? 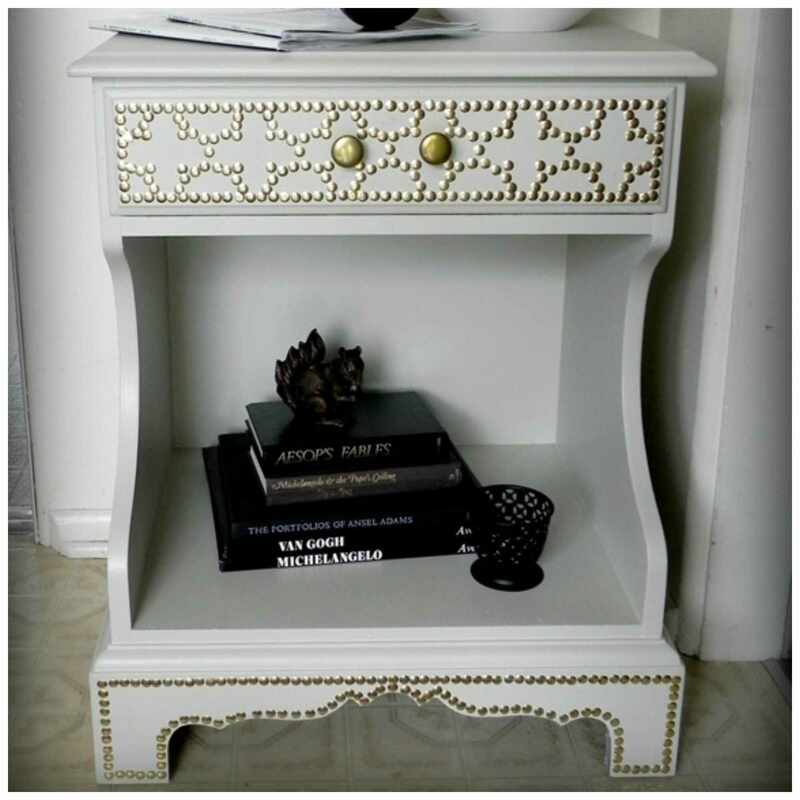 Try embellishing a piece of furniture with nail head trim. This DIY project from Jessica Hill of Made in Crafts (via Decor Hacks) was done for $6. $6!!! This type of project can be done on just about any piece of furniture and is great if you want to update an old, bland piece. It's also great for thrift store and garage sale finds. You wear jewelry because it's pretty, right? So why hide it away in a drawer or a box? Decorative ladders are great for hanging and displaying necklaces and bracelets (and scarves and shoes for that matter). Stay away from the kind of ladder you find in a hardware store and instead scour vintage and home stores for good looking versions. Apple picking ladders work particularly well for these types of displays. We all know there's no easier way to update a piece of furniture than with new hardware. But the same can be said for windows and doors. Change a doorknob, replace a curtain rod, or get some new switch plates. You'll be amazed at the difference it can make. Most people use their silver on special occasions, but what about the rest of the year? Silver vessels make great vases so try using an ice bucket or tea pot to hold a floral arrangement, or fill a silver punch bowl with something decorative and display it on the coffee table. Even gravy boats can be used to display small plants and flower arrangements. Hanging wallpaper or fabric in a frame on the wall is a great way to add a shot of color and pattern to a room. It's also great if there's a particular paper or fabric you love but is too expensive to do a whole room or upholster an entire piece of furniture in it. For maximum impact hang several pieces together in a gallery-style display. Use Washi Tape for... Everything! Washi tape is similar to masking tape but it's available in a seemingly unending array of colors and patterns. Basically it's a crafter and DIYer's dream. Use it to create designs on the wall, embellish pieces of furniture, update lampshades and photo frames, add excitement to the side of a door - the list literally goes on forever. If you need more ideas just search "washi tape" on Pinterest. Vintage jewelry goes in and out of style, so while it's out of style why not use it for something else? Rhinestone brooches make terrific curtain tiebacks, over-the-top necklaces are gorgeous when displayed in shadow boxes, and clip on earrings make perfect place card holders for formal dinging tables. Need to hang some art but don't want to buy more frames? Why not try using clothes hangers? This look works incredibly well for kids art and other types of drawings. Best for casual art, this look is cheap and cheerful at its best.